Jerusalem, Israel — May 17, 2017 … Israeli Prime Minister Benjamin Netanyahu, this evening met with Danish Foreign Minister Anders Samuelsen at his office in Jerusalem. The two discussed bilateral cooperation in the field of innovation. Prime Minister Netanyahu said that the true reason for the absence of a solution to the Palestinian issue is incitement and asked that Denmark halt assistance to Palestinian organizations that support BDS activity. 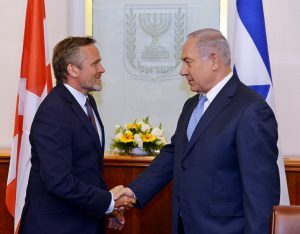 Samuelsen said that Denmarks’s Prime Minister Lars Lokke Rasmussen had condemned antisemitic incidents, in particular the terrorist attack against the synagogue in Copenhagen two years ago, adding that he had reached out to the Jewish community. “We fight antisemitism in Denmark,” he said, and recalled with pride Denmark’s record in rescuing Jews from the Holocaust.